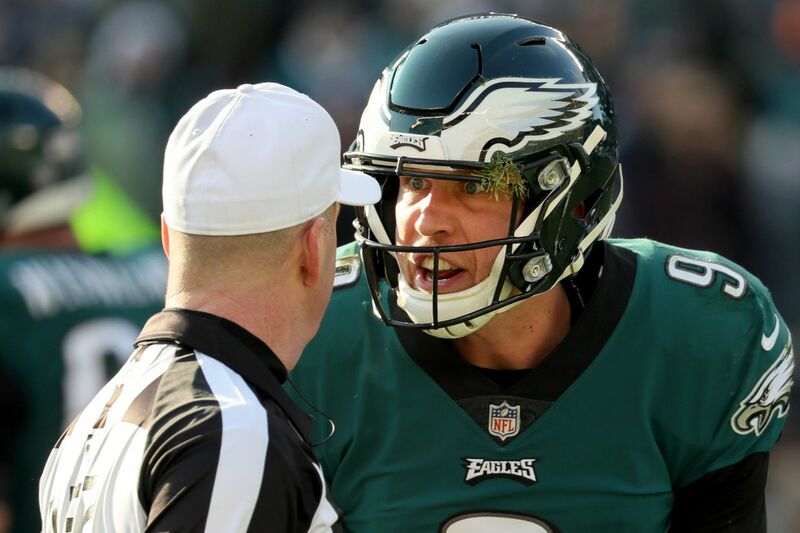 Nick Foles argues with an official after Jadeveon Clowney wasn't called for grabbing Foles' face mask during the second quarter. That he lived, yes, was good. But even cooler was that he returned and led the Eagles to a last-second, 32-30 victory over the Texans. In a career with triumphs and setbacks, twists and turns, and a touch of fairy dust, Sunday was just the latest chapter in the Legend of Foles. Two weeks ago, the reigning Super Bowl MVP was on the bench, three games away from seemingly the end of his career with the Eagles. Foles may still have only one game left in Philadelphia, but not if he’s going to have anything to say about it. Last week, it was knocking off the Rams. This week, it was overcoming a Houston comeback with a dramatic two-minute drive. Foles is entering the pantheon of greatest of NFL backups, and while that may be a dubious honor, he has relished another opportunity to lead the Eagles in Carson Wentz’s injured absence. There is, of course, the chance that the injury Foles suffered when Texans linebacker Jadeveon Clowney drove his helmet into his sternum will sideline him next week at the Redskins. Asked about the X-rays he took after the game, he would only say that his ribs felt “a little sore” and that he felt great. But what if Wentz, who had a stress fracture in his back, were to be cleared to return? If Foles is healthy enough to play, it would be difficult for Pederson to go back to his starter, even though he has said that Wentz would get his job back as soon as he’s ready. With Foles under center, the Eagles offense has put together its most productive back-to-back games all season. Houston was keen on stopping the run, but Foles took advantage through the air and set a franchise record for passing yards, completing 35 of 49 passes for 471 yards and four touchdowns. Foles eclipsed the previous mark of 464 yards, set by Donovan McNabb in 2004, despite several loose throws, including an ugly interception to open the second half. But he kept firing, hitting Alshon Jeffery for 52 yards on his next throw, and a series later, when he dropped a rainbow into the lap of Nelson Agholor for an 83-yard touchdown. Surveying the defensive coverage pre-snap, Foles audibled from one pass play to another. But it will be the two third-down passes Foles completed on the game-winning drive that will be most remembered, especially if the Eagles go on to make the playoffs. After Houston took the lead, 30-29, the offense had the ball on its 11-yard line with two minutes left. Two errant passes set up third-and-10, and the call was to go to Jeffery on a deep dig route. Jeffery pulled in the pass 19 yards downfield, but Foles got clobbered by Clowney, who twisted inside. “He got a good one on me,” Foles said. As trainers huddled over Foles, the crowd started chanting his name, with many clapping their hands in unison over their heads. Wentz, meanwhile, called for center Jason Kelce to come to the sideline and practice snap to backup Nate Sudfeld. Foles finally rose and jogged off to cheers. He needed only one play. Sudfeld took his mandatory one snap and fired a pass wide of receiver Jordan Matthews. Foles missed Agholor on a corner fade on his first play back, but on third down, Pederson dialed up a staple play that had Ertz run a “scissors corner route.” But the tight end got his feet tangled up with a defender on the break. Ertz did and his 20-yard grab advanced the Eagles to the Texans' 35 with 1:23 left. Foles would complete 12 of 13 passes for 149 yards and a touchdown on third down. Two plays later, Darren Sproles picked up 16 yards on a draw, was tackled for no gain on the next play, then Jake Elliott split the uprights from 35 yards out. As Foles ran off the field, he blew kisses to fans who hung over the tunnel. The admiration is just and it extends to inside the locker room. If there’s any teammate that wouldn’t compliment Foles at the expense of Wentz, it’s Ertz, one of Wentz’s best friends on the team. He said as much, but there is no denying the Foles dynamic. Nick Foles blows a kiss to the crowd while walking off the field after beating the Texans on Sunday. But Foles seems to inspire on both sides of the ball. Long, for instance, built a makeshift shrine to the quarterback in his locker stall last week.